Harmony of PINOT NOIR (black grapes) and CHARDONNAY (white grapes), this great-class Champagne proposes finesse, pleasure, distinction and nobility. This champagne is advised for aperitif and for lunch. 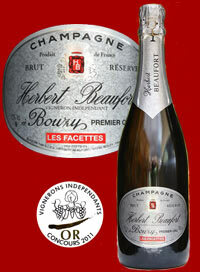 This Champagne is advised for aperitif and with fish and sea-food dishes. 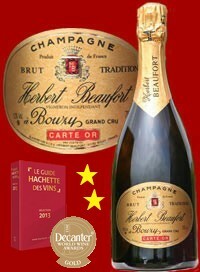 The predominance of the PINOT NOIR grapes gives this Champagne body and strength. The colour is pale gold and the bubbles are elegant. 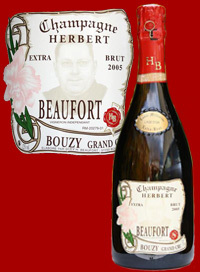 This Champagne is advised for rich dishes. Fine, nervous, rich and dark colored, this PURE PINOT NOIR Champagne is a perfect complement with meat dishes and red-fruits desserts. 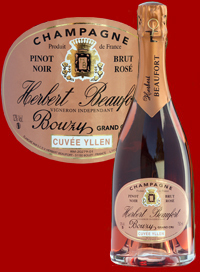 This elegant and very fresh Champagne is a PURE PINOT NOIR without added liqueur. 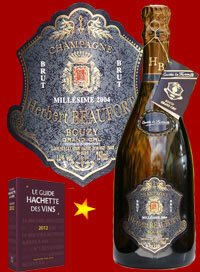 This vintaged Champagne has an authentic bouquet from Bouzy. His strength is advisable for aperitif. 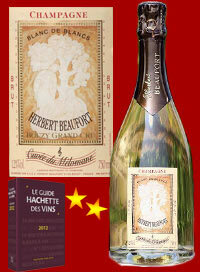 This glamourous Champagne is fine, delicate and selected only during the best years. This vintaged Champagne is a subtle blend of PINOT NOIR and CHARDONNAY.